Today's links include another dramatic Pirate loss, Altoona vs. Pettitte, a former Pirate finding a new team (and the Pirates signing another pitcher from the waiver wire), an update on Max Starks, Big Ben's Hampton HS experience, and much more. The PITTSBURGH PIRATES continued their losing ways, dropping to 48-95 after a 1-0 loss in 10 innings last night against the New York Mets. James McDonald threw eight shutout innings, lowering his ERA to 3.48 in eight starts since joining the Pirates in July, but the Pirate offense stranded 10 runners and blew a leadoff double by Andrew McCutchen in the top of the 10th. 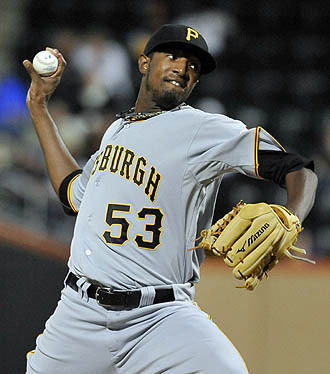 McCutchen was thrown out at third on a bad bunt by Jose Tabata, and the Bucs failed to score after that. The Pirates' Double-A affiliate, the ALTOONA CURVE, will be taking on the Trenton Thunder in a playoff series starting tonight. And who's the pitcher facing them, you ask? Would you believe Andy Pettitte? MAX STARKS could be out a month with the dreaded high-ankle sprain, according to ESPN. Starks said he's had the injury before and he's hopeful to return in Week Three. I think that may be a little too optimistic. "I'm so excited. Just to be able to circle the base paths will be great. ... They've sold 40,000 tickets, I hear. For a game with Pittsburgh! "Pittsburgh is 1-0 without Roethlisberger. Wouldn't it be beautiful if they went 4-0 without him? Wouldn't it be beautiful if Roethlisberger returns to a locker room he has already lost, and discovers his starting job has suffered the same fate?" I'm guessing Greg Doyle didn't actually watch the game Sunday. LOL, Kevin in the comment above read my mind..
Doyle's not the only one. I've seen/heard like 3-4 other football "commentators" make some reference to "Steelers are 1-0! See, they don't need Ben at all!." Nobody is a bigger Dixon supporter than I but even I'm not going out on that limb. Then again, the Jets were supposedly a lock to win the Super Bowl and did anybody see Sanchez last night? That is the guy they expect to win it all? Dixon did a better job against the Ravens making his first career start on 24 hour notice than Sanchise did. Burress - I would have agreed until I saw Sanchez's mastery of the position with less than 2 minutes to play. Sanchez was awful and the Chargers look to be in their early season form as well. Another 10 point performance from Flacco; I know the Jets defense is good but what is the hype about this guy. It seems like every writer, pundit and analyst believes a winning, or .500, record in Ben's absence means he will not be the starter. Well, the Chargers normally start off slow because they play outside of their divion early. Then, they run through the worst division in the AFC and get a playoff spot and it's Charger-Mania. It seems like every season they are the " best 3-5 team in the league" or something similar to that. I don't see how anybody can question Ben's position. This may be wrong, but i think he is one of TWO QB's in the league with multiple SB wins. And if people think that doesn't mean anything, good for them. I respect certain people's opinions, but anybody who suggests a healthy Ben doesn't replace Dixon when he returns is just plain wrong unless Dixon goes 20/24 for 250 and 3 TD 0 Ints each game. because Mark Sanchez looked tuuuurrrrible against our rowdy fans on Monday night. But to say that Dennis Dixon is a better quarterback than Mark Sanchez is an ignorant argument that you won't win. By the way, does anyone else notice the blatant racism of people at Jets games wearing green sombreros? Sure he's got a Mexican last name, but he was born 'n raised en los estados unidos.